"Better Man" is a song written by Taylor. It was recorded by American country group Little Big Town for their eighth studio album, "The Breaker", which was released on February 24, 2017. The song was released as the album's lead single on October 20, 2016. Its music video was released on November 1, 2016. "Better Man" won the award for "Song of the Year" at the 2017 CMA Awards, an award that goes directly to the songwriter -- Taylor. The song was (reportedly) written about the breakup of the relationship of Taylor with Scottish DJ Calvin Harris. According to group member Karen Fairchild, Taylor thought of the group because of the harmonies, and sent the song to them. "We thanked the good Lord it didn't go in his spam folder," Sweet's bandmate Kimberly Schlapman joked to PEOPLE Magazine. Sweet sent the demo to the rest of the band, and there was an unanimous, enthusiastic vote to record it. "We all listened to it individually and then we were on the road with Luke Bryan all year," Schlapman said. "So every evening in the dressing room when we were getting ready, we would play the song over and over and over. Instantly that chorus had us hooked. The lush harmony felt so much like us!" Kevin John Coyne of Country Universe rated the song "A", saying that "It’s a concept that is grounded in so much truth that I’m amazed I’ve never heard it approached this way before" and "The writers do a great job of capturing both why [the song's narrator] stayed so long and why she had to leave, and all of the conflicting feelings that go along with that." Taste of Country writer Billy Dukes also praised the song, saying that "This song isn’t as jarring as some of the quartet’s most recent hits. In fact, the mistreatment of women is only vaguely alluded to — there’s no one line that burns the hair off the back of your neck. Jay Joyce’s arrangement is soft but not stark. It’s among his more mainstream productions. Still, it’s clear Fairchild’s protagonist is reeling from a love that went very, very wrong." The song sold 6'000 copies on its first day of release, enough to allow the song to enter the Hot Country Songs chart at No. 41. It sold 20,000 the following week, and rose to No. 20 in the chart. In its third week it sold a further 47,000 copies and climbed further to No. 6. 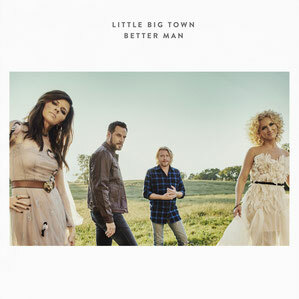 On the Hot Country Songs chart dated February 11, 2017, "Better Man" reached number one, earning the group their third leader. "Better Man" won the award for "Song of the Year" at the 2017 CMAs and was nominated for "Best Country Song" at the 2018 GRAMMY Awards.